Sunsets lend themselves to sentiment. They bring home the idea of large forces at work in the universe. They epitomize the fleeting nature of beauty. They are so grand and romantic, and at the same time so transitory. You want to grab a beautiful sunset, absorb it in some way, but of course, how can you do that? They're gone in no time, leaving only the flattened-out, gray light of evening. So what happens to someone who sets out to capture that fragile experience, over and over and over again, nearly every day over the course of a year? David Gallup, an uncommonly cheerful fellow, may be the only person who has actually done such a thing. His good cheer makes one wonder if painting sunsets might not be the key to happiness. An outdoor painter by profession, Gallup was inspired by the end of the millennium to paint sunsets throughout California, one a day on location for nearly each day of 1999. He calls his sunsets "a treat to himself," and is pleased as can be that he knows how to paint something so special. "One of the wonderful things I learned," he says of his year of hard work, "was how to get it down quickly and right the first time. A sunset is a fleeting effect. Being able to capture it is a wonderful feeling." Gallup's first sunset, titled Heavenly Fire and dated January 1, is a sky-only view of colorfully nuanced clouds near his house in Thousand Oaks; his final one shows land, water, and a sky of murky light over the Golden Gate Bridge(Millennium Farewell). By the time Gallup packed up his easel and brushes in San Francisco on December 31, he had a collection of 200 identically sized oil paintings depicting sunsets of all sorts -- fiery, calm, electric, muted, golden, puffy, streaky, rosy -- each the size of the typical computer monitor, each of quick, rough brushstrokes, each done in the time it took for the sunset to play itself out, as briefly as 10 minutes in winter and as long as 35 minutes in summer. He learned where to find clouds that would reflect the sun, how rain would lead to stunning effects, that autumn was the best time for sunsets, that the sky in spring turns soft pink, and that sunsets happen all around, not just to the west. "I can now go out and grab those special moments," he says. "I became a cloud chaser." At the end of his project, Gallup sorted through the mass of paintings, chose what he thought was the best example from each year, and destroyed the rest. The resulting series -- cheery, confident old-school paintings with an oh-so-slight contemporary conceptual edge -- can be seen, hanging in chronological order and neatly framed, at the Wake Me When I'm Famous Fine Art Gallery on Westwood Boulevard, or on the web site www.52sunsets.com under the straightforward name "52 California Sunsets". He is especially pleased with their installation. One of the dilemmas of painting sunsets, he says, smiling, is that they extend in every direction, not just in front of you, and yet a painting only depicts one angle. "I wanted to freeze them," he says. "It was frustrating only to be able to capture what was directly in front of me." In the gallery, he says, sunset light is all around in the room, bathing the viewer in its glow. Maybe Gallup is so cheerful because each painting brings back the experience of the sunset and the day he painted it, both things he clearly adores. Out of doors, breeze in his face, creating something new in the moments it takes some people to take a shower or do the dishes. He shares his sunset memories with viewers via short, explanatory wall notes. "By this point," he writes of the first, "I had already spent three months experimenting with canvas size, portable lighting, and different pallettes." Of another, titled The Commuter's Reward, painted August 28 and depicting the Kanan Road 101 off-ramp , with its smattering of lights from fast food signs: "It's the sight that tells me 'I'm home' when I return from L.A." Of Mystical Light, painted near Hansen Dam: "I shouldn't have been able to paint this painting from the parking lot of the dam, as it closed at sunset -- 15 minutes before I was done. The thing that saved me was that the Park Rangers had all stopped locking up to watch the sky." Gallup studied art in school, and is no stranger to the effort it takes to make the hand do what the mind sees. At Otis Parsons he was an illustration major for this very reason. "I always wanted to be a fine arts painter," he explains, "but the program when I was there was geared to modern art. I wanted to get skills to capture what I saw in paint. Illustrators were the ones who were doing that there." Though he did earn his living for a while doing illustrations, he soon began to devote himself to painting full time. 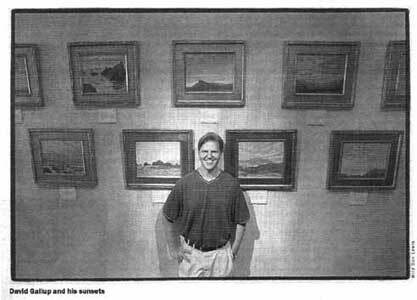 Before he grappled with those sunsets in the evenings, he'd spend his days doing somewhat larger landscape paintings, turning out several a week and supplying them to various galleries around the state. Looking at a couple of these paintings on the small second level of the Wake Me gallery, Gallup refers to a current show in Pasadena of activist artists, specifically land conservation artists, of which he is one. "It's hard not to feel some responsibility to preserve the landscape when you're out there painting it all the time," he says. He points to the unblemished vista in one of his works and laments that a housing development has since gone up there, marring the scene. "From the artist's point of view," he says, "when we paint, it's not only to capture and preserve an unspoiled area, but also to show to other people who don't get out in nature, 'Look at this beautiful place!'" Gallup says "we" with the weight of others on his shoulders -- not just his fellow activist artists, but all the California plein-air painters before him who took canvas and easel to the great outdoors and poured out their love of the state. This includes painters such as William Wendt, Edgar Payne, and Guy Rose, whose work form the '20s and '30s is newly fashionable -- with prices for their canvases rising rapidly -- and, before them, the French Impressionists who were their greatest influence. Gallup's own route to California plein air impressionism can be traced to a blockbuster show at LACMA, which he visited while he was still in art school. "I saw Monets and Sisselys and sun-dappled nudes. All the great ones were there. Everyone in L.A. went to see it. When I came out I saw the parks differently. They looked like spots of paint. It changed my life." He became a plein air painter at that moment and has traveled a straight path since. But even with his newfound powers -- his ability to get it all down fast and right, his knack for capturing the evanescent and having it pay his bills -- there are forces he hasn't been able to master. "Rain, heat, flies, sunshine -- I don't care about any of that," he says. "But when wind comes up and you can't stand back to see a painting because the easel will fall over, that's trouble. It happened once at the beach. I had sand everywhere. It just stuck to the painting. There's no coming back from it. The business cards and flyers I keep in the easel to give to people -- all of it was flying down the beach. I was in a bad mood. Maybe the only time." Despite the rich historical heritage he draws on -- or maybe because of it -- Gallup's work is far out of the mainstream of modern art. Not that he minds. In fact, he doesn't believe that it is. Plein air painting is on the rise, he says, in Laguna, Carmel, and Pasadena, if not in New York or L.A. "People are burned out looking at things they don't recognize," he says. "Traditional art, representational art -- this time it's coming back with a very strong conservation attitude. Modern art sounds like an oxymoron at this point." To some people, of course, it always has. Ironically, the acknowledgment of the passage of time that is inherent in a painting of a sunset is obliterated by a work of art that echoes so strongly paintings of the past, and might have been painted 75 years ago. Gallup described one of his favorite modern works, a sculpture by Yoko Ono called Box of Smiles that he saw on exhibit at the Dorothy Chandler Pavilion, of all places. "It was a jewel-encrusted box with a mirror inside," he says. "The concept and interaction forced you to smile, and your smile becomes part to the art. It was a brilliant piece." He adds, by way of apology for the lack of additional examples, "My work takes full time. I don't get a lot of time to experience more." The exhibit runs from July 1 - July 31 2000.